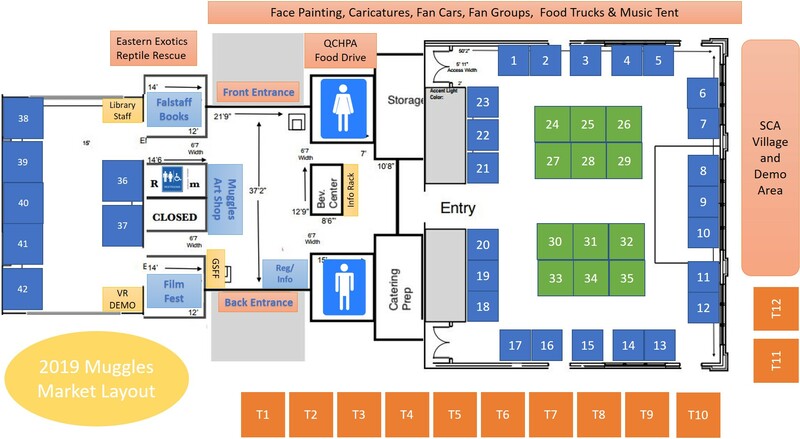 Setup/Breakdown: Setup is 7 AM – 9:30 AM, Breakdown is 4 PM – 6 PM. Please plan accordingly. Outside Spaces: This year we will again have 12 outdoor artisan spaces. These will be available on a rain or shine basis, and require the artisan to provide their own tent, tables, and chairs. Free marketing and promotion of the event including featured spotlight of your business on our website and social media. Interior spaces (green) are approx. 6 x 7 but do not have easy access to power. Exterior spaces (blue) are 6 x 6 and have wall access to power. Lawn spaces (orange) are approx. 10 x 10 and do not have access to power. NOTE: This is a Juried event. GEEK GALA reserves the right to refuse sale of artisan’s space if the organizer does not feel that it is in the best interest of the artisan or other artisans booked to do so or if the wares sold do not support the intended artisan atmosphere. Acceptance is based upon submitted item description and resulting discussions. Artisan must notify organizers prior to changing or adding additional merchandise for sale as it may conflict with other accepted and juried artisans. GEEK GALA cannot hold market spaces until at least a 50% deposit is paid on their invoice. This payment is due within 5 days of receipt. Payment of the invoice is acceptance of the conditions as outlined below and on the invoice. The balance must be paid within 30 days to hold a space. Payment can be made through our PayPal account gala@charlottegeeks.com Please check with the Geek Gala organizer to make sure space is available before paying for the space. Full refund less 10% handling fee if cancelled by July 31, 2019. Full refund less 25% handling fee if cancelled by September 31, 2019. No refund after September 31, 2019. Requests will be handled on a case by case basis. If GEEK GALA cancels, artisans receive a full refund. GEEK GALA will provide some measure of security during market operating hours to deter shoplifting, or damage to property. [ARTISAN] is not to leave their vending space unattended, and should bring adequate staff to protect the security of their space. [ARTISAN] is responsible for collecting, reporting and paying NC sales tax. GEEK GALA will not be responsible for the collection of these taxes nor will be held liable if any State of NC official comes to the event to collect the taxes on site. 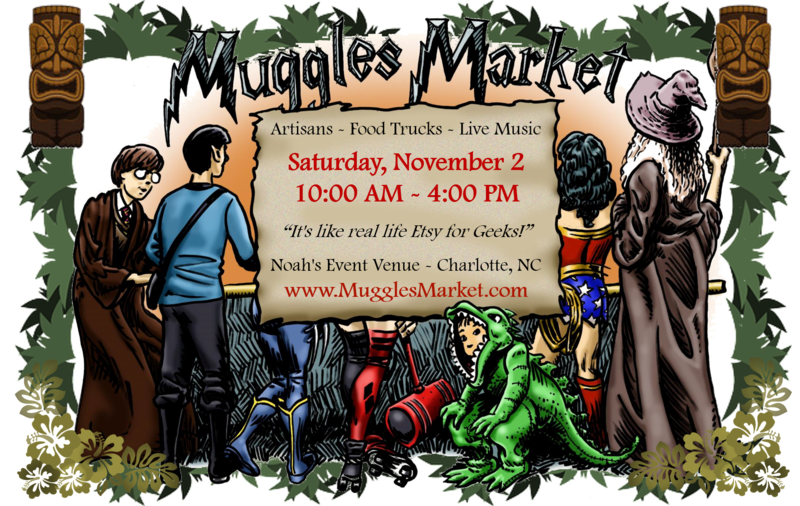 Please complete the information below to be considered as an artisan for our 2019 Muggles Market. Our staff will review your application shortly. Please give us a link where we can view samples of your products - thanks! Please tell us what you plan to sell. PLEASE BE SPECIFIC. If you would like more than one space, please add quantity in the comments below. 1 6' table is included with your inside space at no additional charge. Lawn spaces must bring their own tables and chairs. 1 companion pass is included with your acceptance. Up to 2 more may be added at $15 each. Thanks for your interest – we hope to work together soon!